Minimalistic in design with a natural rusted finish, our range of oxidised firepits are fuss and maintenance free. Enjoy the outdoors for longer with our charming new range of Oxidised Firepits. Brand new for 2018, these impressive firepits feature cast iron bowls with sturdy steel legs, complete with a naturally oxidised finish that requires very little maintenance. 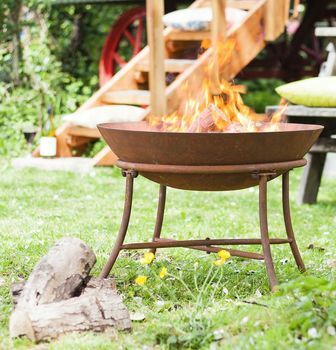 Made from cast iron and steel this firepit is finished in natural rusted colour. Burns wood perfectly to provide good heat. This product is dispatched to you by Garden Leisure.